A breathtaking Jodhpur pre-wedding shoot with the most unique and beautiful outfits! 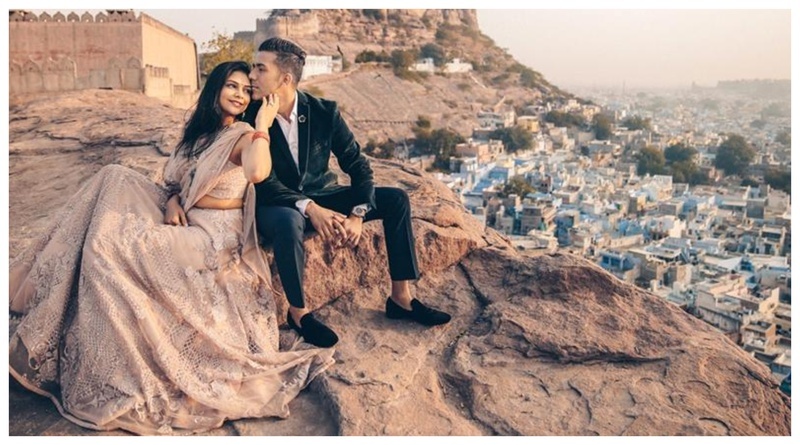 Jodhpur is one of the hottest destination for pre-wedding shoot.Well, you’ll think so too after you check out this pre-wedding shoot shot brilliantly by Shades Photography . Love this mesmerising shot literally giving the ‘on the top of the world’ feels! In the first look Radhika is spotted wearing a stunning net lehenga with an embroidered net overlay comprising of a high-waist lehenga skirt paired with a heavily embroidered bustier and a sheer dupatta. She has completed the look with a statement long necklace bringing the pop-of-color with the green gemstones and red bangles. I am totally in awe of this couple’s second look. It’s quite a contrast to the first one. Lalit is spotted wearing an asymmetrical kurta paired with a military bandhgala jacket while Radhika is sporting a long trench with a stunning hand embroidery. P.S. loving how her pants match her collar though. I’m the happiest when I'm right next you! If you too are planning to do your pre-wedding shoot soon, then I hope you have got all the inspo you need right here!